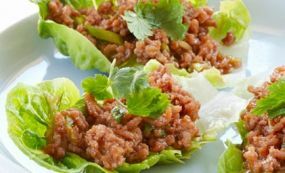 Pork Lettuce Wraps are a Cambodian Food Recipe flavored with cilantro, mint and fish sauce. Add 1½ tablespoon fish sauce into ground meat and marinate 15 minutes in refrigerator. Bring broth to simmer in 12-inch nonstick skillet over medium-high heat. Add pork and cook, stirring frequently, until about half of pork is no longer pink, about 2 minutes. Transfer pork to large bowl; let cool 10 minutes. Add remaining tablespoon fish sauce, shallots, lime juice, sugar, red pepper, mint, and cilantro to pork; toss to combine.